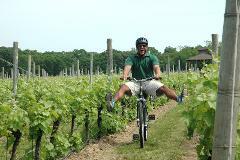 “Awarded the Gold RIbbon for 2016 and 2018” by Dan’s Paper “Best of the Best 2016 & 2018” for Best Bike Tour Company” This guided tour is ranked as one of our finest and best tours of the Long Island Wine Region. A guided, leisurely bike ride that encompasses hand picked stops & special treatment from our guide staff; this all-inclusive tour includes vineyard, brewery, farm & beach stops; Experience craft beers, wine, oil & fine vinegar tastings! 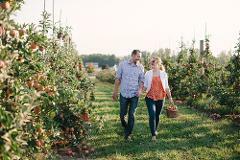 Enjoy a guided, leisurely bike ride that encompasses hand picked stops & special treatment from our guide staff; this versatile tour comprised of wine-tastings, & hand picked berries (u-pick) & an optional catered village style lunch.